Seberang Perai on Penang mainland has gained the interest of property investors and homebuyers in recent years, made evident by the strong housing price growth recorded over the past six years. Bordered by Kedah to the north and Perak to the south, the 751 sq km Seberang Perai boasts a number of new and major development projects that have and will continue to boost the local economy. 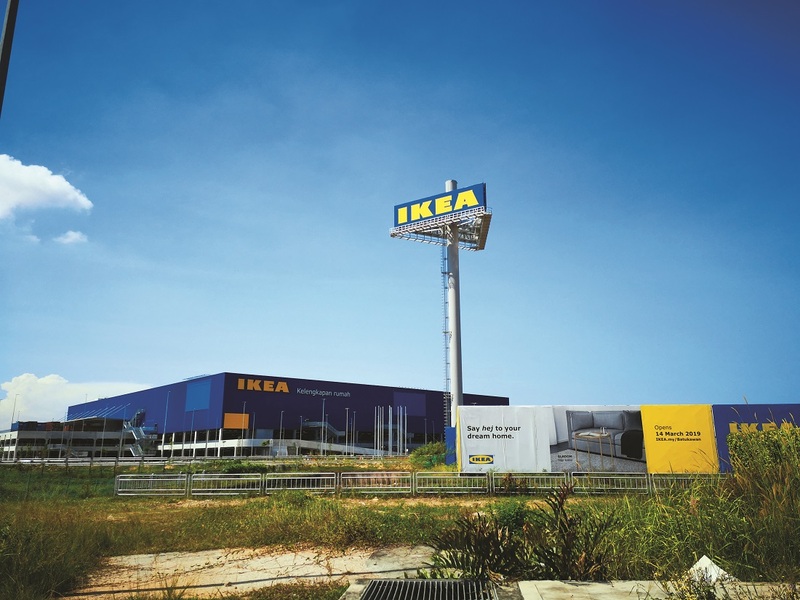 These developments include the 245-acre Aspen Vision City, Utropolis and the soon-to-be-open Swedish furniture store IKEA all located in Batu Kawan, Pearl City at Simpang Ampat and the upcoming 1,675-acre Setia Fontaines in Butterworth. There is also the highly-anticipated Penang Transport Master Plan (PTMP) which aims to enhance connectivity between Penang and the mainland. 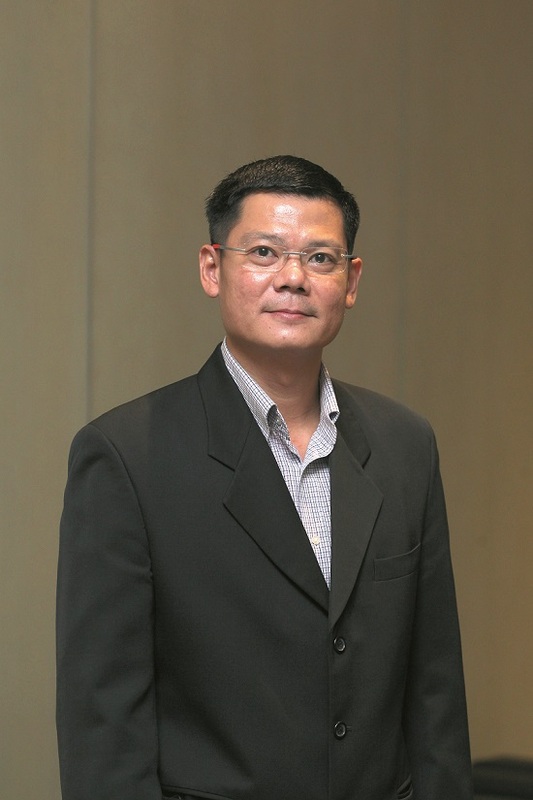 Although some may attribute the housing price growth to investors motivated by future capital appreciation of the properties when the new developments and infrastructure are completed, PA International Property Consultants (Penang) Sdn Bhd executive director Michael Loo says demand has mainly been driven by home buyers from Penang Island and those from the Northern region of Peninsular Malaysia. Malaysia Statistics Department data shows that the island and mainland population ratio currently stands at 54:46 or a population of 800,500 on the mainland and 946,200 on Penang Island. Homes on Penang Island are becoming increasingly unaffordable for young homebuyers, pushing many to consider settling on the mainland where they can get large landed homes with lifestyle offerings at a lower price than on the island. EdgeProp.my transaction data shows that in 2017, the average price for a double-storey terraced house on the island was around RM1.06 million or RM612 psf, based on land size, compared with those in Seberang Perai which was around RM355,088 or an average RM246 psf — a difference of 149%! Besides the price factor, job opportunities are aplenty with many jobs created from the new catalytic projects on the mainland. This has led young adults from northern Perak, Kedah and Perlis to work here, and many have decided to purchase a home near their workplace. The younger generation of local mainlanders who are looking for homes close to their siblings and parents are also supporting the demand for homes here, says Loo. Penang-based Elite Properties Sdn Bhd senior negotiator Season Ting finds that enquiries for homes in Seberang Perai is rising with a majority looking for new terraced houses at affordable prices in areas with easy accessibility to highways and amenities such as Bukit Mertajam, Alma, Raja Uda and Batu Kawan. 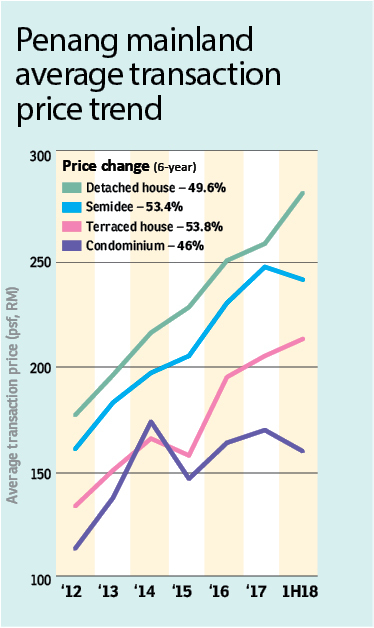 Although recent transaction volume has marginally declined due to a general weakening of the country’s property market, Seberang Perai’s housing prices have continued to climb over the past six years. 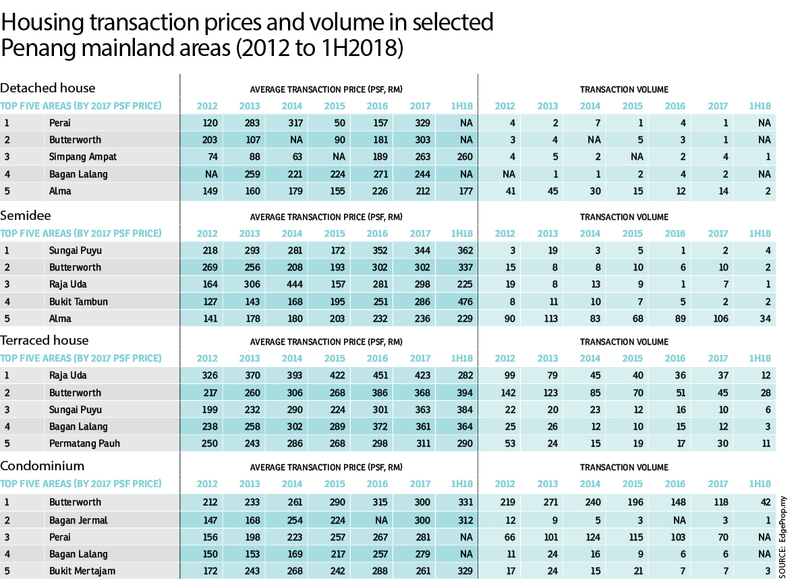 From 2012 to 2017, the average price appreciation of landed homes in Seberang Perai ranged between 49.6% and 53.8% while high-rise residences (excluding low cost flats) have seen their average transaction price surge 46% over the six-year period. Terraced houses were the most popular although their transaction volume has declined to 1,608 in 2017 from 3,603 in 2012. The average selling price of terraced houses in Seberang Perai rose by about 53.8% to RM246 psf in 2017 from RM160 psf in 2012. In the first six months of 2018 (1H2018), 642 terraced homes were transacted at an average price of around RM240 psf. In 2017, some 623 semidee homes changed hands at an average transaction price of RM204 psf which was a 53.4% rise from RM133 psf in 2012. In 1H2018, 169 semidee houses were sold at an average price of RM212 psf. As for detached houses, their average transacted price increased 49.6% to RM169 in 2017 from RM113 psf in 2012. In 1H2018, there were 37 transactions which were sold at an average price of RM159 psf. Meanwhile, the average transacted price of condominium/apartment units (excluding low cost flats) jumped 46% to RM257 psf based on built-up size in 2017 (with a total of 378 units transacted), from RM176 psf in 2012. The average selling price climbed further to RM281 psf in 1H2018 with 133 units transacted. Henry Butcher Penang senior vice-president for asset valuation Shawn Ong said two- to three-storey terraced houses and semidees made up the bulk of residential properties launched in Seberang Perai over the past two decades. At least 70% of the mainland residential properties are bought by Penangites while about 10% to 20% are buyers who hailed from neighbouring states but work in Penang. Although prices have risen over the years, the slowdown in the global and local economies as well as the rising cost of living have dampened the market in Seberang Perai lately. “Potential buyers, especially property speculators are holding back given the uncertainties in both the global and local economies as well as the financing restrictions imposed by Bank Negara Malaysia. The high prices of newly-launched landed homes in established housing areas in Seberang Perai also do not help,” he explains. However, genuine homebuyers are still looking to buy, hence Ong deems the overall take-up rate of existing and newly-launched residential properties in Seberang Perai as still reasonably healthy. Besides the lure of work opportunities on the Penang mainland, the younger generation are also more open to lifestyle township developments and high-rise living. “More are willing to consider condominium living as prices of landed properties especially terraced houses are becoming unaffordable to many mid-income buyers. Shrinking family size, demand for recreational facilities and better living quality as well as improved road accessibility are also encouraging many to consider high-rise living,” says Ong. He foresees higher demand for condominium units in Butterworth, Perai as well as Batu Kawan in the near future. Meanwhile, property developers have come up with holistic township developments with lifestyle elements, gated and guarded communities as well as recreational features that provide a safe and healthy living environment on the mainland. This concept has also caught the attention of many young homebuyers. When it comes to investment locations, Batu Kawan is the firm favourite of property consultants due to its exciting offerings. PA International’s Loo expects this upcoming satellite town to be the most sought-after location for property purchasers in Penang. “Batu Kawan is expected to be fully transformed within 10 to 20 years. The Batu Kawan Industrial Park (BKIP) has attracted big MNCs (multinational corporations) such as VAT, Honda and Sandisk. There are also mixed developments such as Aspen Vision City by Aspen Group, One Auto Hub by PKT Logistics, Utropolis by Paramount Property, IKEA Mall and Eco Horizon by EcoWorld,” he says. Elite Properties’ Ting concurs that Batu Kawan has all the elements – industrial, retail, commercial, education and residential, to become a self-sustaining city in Penang. Beyond Batu Kawan, Henry Butcher’s Ong sees opportunities for investors in matured areas in Seberang Perai Tengah, namely Perai, Seberang Jaya, as well as Alma and Rozhan in Bukit Mertajam. Ong says each of the areas has its own strengths. For instance, Perai can benefit from the Perai Industrial Park and the newly completed Penang Sentral Transportation Hub – a transit-oriented development by Malaysian Resources Corporation Bhd. Meanwhile, Seberang Jaya has easy access as it is located close to the North-South Expressway Interchange and Sunway Commercial Hub. As for Alma and Rozhan in Bukit Mertajam, a wide range of amenities are offered, including the AEON Shopping Centre and Tesco Hypermarket, he says. While much of the limelight has been on the more exciting lifestyle integrated and township developments on the mainland especially in Batu Kawan, there is no denying the fact that the industrial sector will continue to be the mainstay of the local economy. Ong notes that over the last decade, the property market in Seberang Perai has experienced a phase of modernisation contributed by the growth in private sector investment in Penang mainland. This has generated new economic activities and demand for housing. Hence, more residential and commercial developments are expected to come up in Seberang Perai particularly in Seberang Perai Tengah (Bukit Mertajam, Bukit Minyak and Alma areas) and Seberang Perai Selatan (Batu Kawan, Simpang Ampat and Valdor areas). “We foresee the industrial sector to continue being the main catalyst for the growth of the property market in Seberang Perai,” he says. PA International’s Loo notes that Penang continues to be among the top two recipients of approved investments in the manufacturing sector after Johor, with the northern state receiving a total of RM10.8 billion in approved investments for the manufacturing sector in 2017. As of today, more than 26 Global Business Services (GBS) companies have set up offices in Penang, either on the island or mainland. Among them are AMD Global Shared Services, AirAsia Global Shared Services, Citigroup, Dell and IHS. 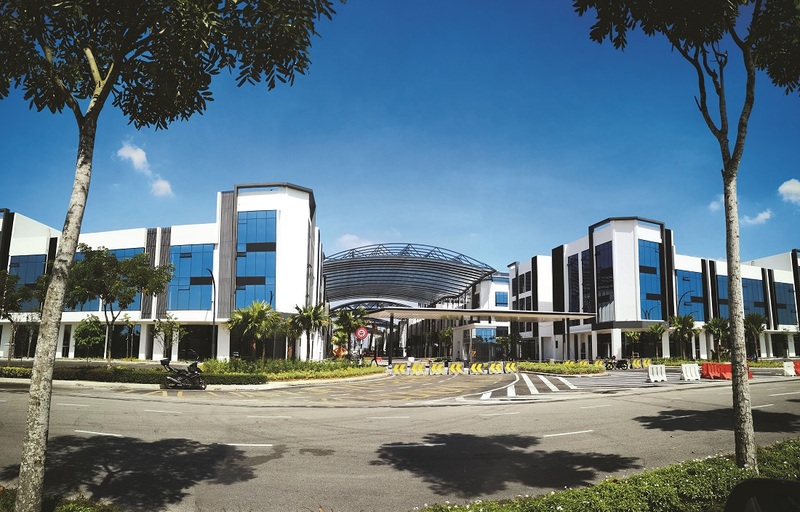 The Penang government has also initiated six on-going industrial developments catering to different sectors, three of which are on Penang’s mainland. These projects are: Penang Creative Animation Triggers @ George Town (2.3 acres), Penang BPO Prime in Bayan Baru (6.8 acres), Penang BPO Park in Bayan Lepas (74 acres), Penang International Technology Park (200 acres in Batu Kawan), High Value Manufacturing @ Batu Kawan Industrial Park (1,500 acres) and the Penang Education Hub also in Batu Kawan. “The transition to Industry 4.0 requires huge changes and new skills not only within discrete functions, such as manufacturing, but also across the entire industry — touching almost every part of the supply chain. This latest industrial revolution will allow for greater changes in the Penang industrial arena and allow the Penang state to progress as a high-income economy,” notes Loo. The vastness of land for township developments could be Penang mainland’s greatest advantage. However, lack of proper infrastructure and connectivity within towns and between the island and mainland could be stumbling blocks to investors. 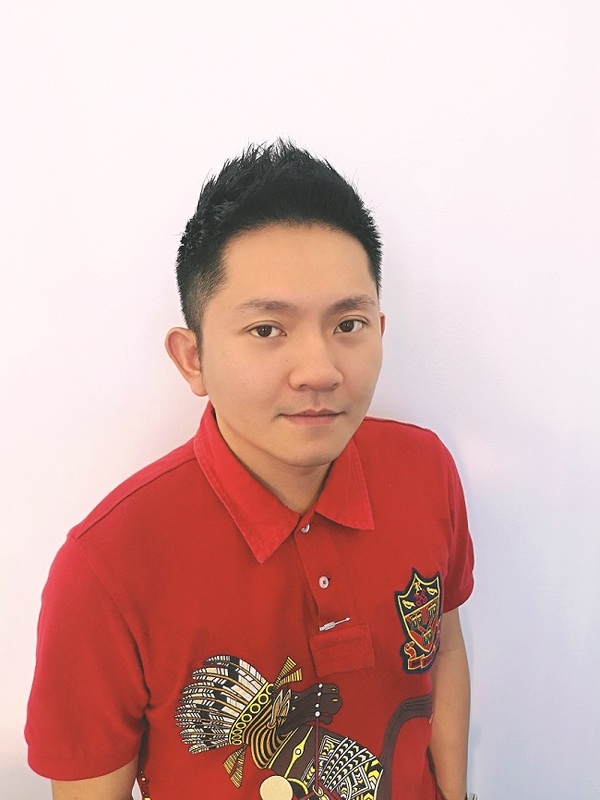 Elite Properties’ Ting opines that local authorities need to review current road networks and town planning to ensure every area in Seberang Perai is well connected, to allow every area to enjoy the spillover effect of upcoming growth and development. Loo from PA International opines that the proposed light rapid transit (LRT) line from Penang Airport to Penang Sentral in the mainland would be the key infrastructure linking the mainland and Island. “The rail transport system could alleviate the existing heavy traffic load on the Penang Bridge as well as boost the tourism industry, bringing tourists from the mainland to the island, or vice-versa,” he says. Aside from the rail transport system, Henry Butcher’s Ong notes that Seberang Perai also needs to improve current amenities to embrace future needs. These include larger hospitals or medical centres, one-stop government agencies, recreational elements such as well-landscaped public parks and hotel choices for tourists. This story first appeared in the EdgeProp.my pullout on Jan 18, 2019. You can access back issues here.